I’ll try to keep this somewhat short and sweet; how about month-by-month? I should be able to slice this Quesadilla Grande into neat little pieces that each includes 30 days of mind-blowing scenery, blissful relaxation, challenges met, lessons learned, and awesome adventures! Yah, sure, you betcha! Well, I’ll give it my best shot. So without further ado, we present to you the Blogger’s Digest version of A Year on Happy Dance! January was spent traveling (big duh there, right?). But wait; maybe a little background is necessary to fill you in on how we happened to be traveling via every mode of transportation other than a sailboat at the start of 2013. The sale of the Inn was final on November 20, 2012 (also my Dad’s 90th birthday! ), and that is when we officially moved onboard Happy Dance (with an 8’x10’ shed holding a few items that wouldn’t fit), in Anacortes Marina. Winter in Anacortes is a bit dark and damp (major understatement), so we decided to leave the premises for a bit while our friends at Marine Service Center added some new bells and whistles to our lovely home. We packed our packs and headed for sunshine, and found ourselves on a cruise in the Caribbean for Christmas. From there we flew to Isla Mujeres, our favorite island on the eastern coast of Mexico for some more sun, then to Williamsburg, Virginia, and finally a train to Washington DC! It was relaxation, cultural overload, an up close and personal national history lesson, a vacation of many, diverse WOWs! He thinks the service will last..ha! St Kitts? St Martin? St? Where the signatures ended the Revolution. The Moore House, in Yorktown. February was drippy. We spent most of our time wiping windows and walls, trying to soak up the condensation inside Happy Dance and trying to avoid getting mold between our toes while in Anacortes. We learned about living on a boat in the rain at the dock (not something we’d recommend), and how long boat projects take. In an attempt not to go stir crazy we took many excursions, bike rides, hikes, and visits to the Rock Fish Grill or Anthony’s. March was filled with preparation, provisioning, baseball, and Bon Voyage! We made our annual baseball pilgrimage to draft day in Las Vegas, had a Cunningham Clan get together in Pahrump at Bob’s new digs, and celebrated Dresser durability by gathering for Bingo night on Grandmom Dresser’s 100th birthday. Visits and visitors, packing and purging were the themes as we prepared to toss the dock lines permanently! A man and his tools…scary! May was a month of celebration. We enjoyed 10 days of magnificent merriment in Princess Louisa Inlet, commemorated McMartyMan Day in style in Thurston Bay with our very first bear sighting, followed by family festivities as we gathered for Greg’s graduation from Pacific University. See that speck in the right hand corner? That’s Happy Dance! June was slow. Short travel days, quiet anchorages, just he and me…a lovely month! We were mainly in the Broughtons, an archipelago just south of Queen Charlotte Sound. We visited places that each had a specific personality. It was early in the season, so we were able to meet a few people, but for the most part we were on our own with the bears, the crabs, and our first fish! July was full speed ahead! 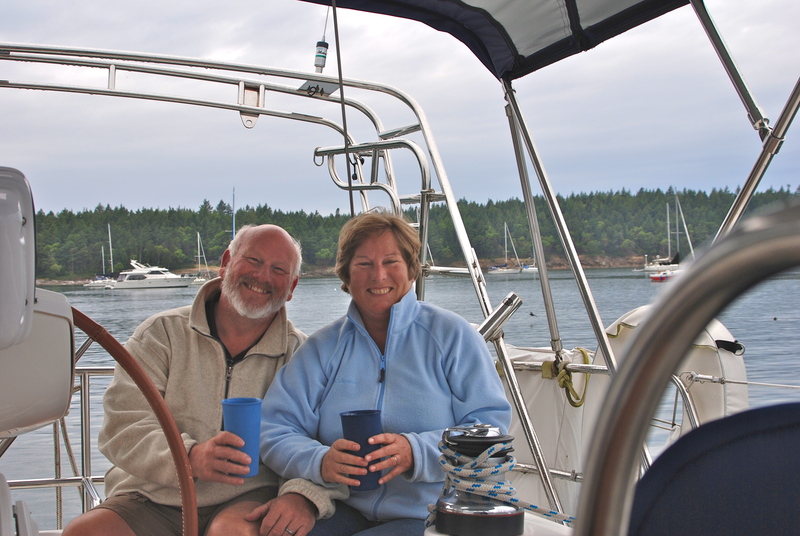 We joined up with the Sail Alaska flotilla, and headed toward Ketchikan. The scenery became progressively more dramatic, the wildlife more wild, and the gathering of new friends made it all the more special. Alaska was everything we thought it would be, and more. Now what do I do?? Another evening full of laughs! August was full of contrasts. Hot springs and glacier ice, rain storms in Ketchikan, fog on the ocean, and sunshine in San Francisco. We enjoyed the last couple of weeks in Alasks with our new friends from Sail Alaska, then prepared for the long offshore trip to California. As luck would have it we just missed the perfect wind window to get south, so we sat in the rain in Ketchikan for a week waiting for another opportunity. When it finally came, we jumped at it and headed south, first against the wind, and then without wind. A long 8 days of motoring and watching the miles (1253 of them) tick off….until finally, the Golden Gate! We are three happy amigos…the trip is done! September was warm, with family, friends, and sunshine in California! We harbor hopped our way from San Francisco to San Diego, with plenty of visits in between. Marty was honorary “sorry we missed the reunion” man for a night, when many of his grade school and high school friends joined us for a bar-b-que at the King Harbor Marina – great fun! Kyle went to Catalina with us! October was spent in San Diego, making last minute preparations for the trip to Mexico. Paperwork, licenses, wind steerage systems, fix its, and provisitioning…all in sunny San Diego. And I even learned to make tortillas! Then the moment came, it was time to get to the starting line of the Baja Ha Ha! Just a mere 875 miles to go. A wild ride with 140 of our favorite boat buddies! I see it I see it! Time to celebrate…we did it! November was the start of another adventure – life on the hook in Mexico! We arrived in Cabo San Lucas, spent a few days catching up on our sleep, sharing adventure stories with friends, and preparing for the next leg. We headed around the cape and back toward the north, into the Sea of Cortez. What a new world. Crystal clear waters, quiet anchorages, fish, turtles, dolphins, whales, and white sandy beaches…incredible. This was what we’d been waiting for…until the Northers showed up, with a cold layer of winds rushing through. Cheryl and Roy, crew extraordinaire! December found us heading south again, leaving the Sea of Cortez for awhile to seek warmer temperatures in Banderas Bay. We made the passage to Mazatlan from the eastern cape, then enjoyed a quiet Christmas at the dock. Today is New Year’s Eve, and we’ll be tossing the dock lines to head a bit further south, to San Blas. It’s another overnight sail to get there which we feel is appropriate, as that’s the only way we’ll ever stay awake to welcome the new year! We’ll be under the stars in a dark moonless night celebrating a fantastic 2013, with over 5,000 miles under the keel, and sharing our excitement about what 2014 will bring. Happy New Year to all! loved your recap of 2013. Now keep a daily log of 2014, so no adventue will be forgotten. I looked at all the pictures and they were awsome. Happy New Year! We ended up getting a 50′ Ocean Alexander Mark1.